Start the new year with a bang by throwing a bigger and better bash than ever before! Pick a fun theme then let the festivities begin while you all count down the clock. The V.I.P. of the guest list at your New Year's party will be the Margaritaville® Tahiti™ Frozen Concoction Maker®, a dazzling automatic frozen drink bar that enables you to have multiple types of frozen concoctions on deck thanks to its three innovative blending stations. You'll never run out drinks for even the largest parties, ensuring your New Year's Eve shindig is one for the ages! Hear ye, hear ye, kings and queens, squires and maidens - let your imagination run wild this New Year's Eve with a fantasy-themed party. Party guests can mix and mingle in a party space draped with gauzy fabrics in purple and red, with lanterns and sconces filled with electric candles hanging from the rafters. Bowls of gold coins promise of the riches to come in the new year, while fabric pennants and flags printed or painted with lions and crowns let guests know your party rules. Make a focal point of the room a table set with a decadent feast fit for a king, replete with stacks of turkey legs, roasted potatoes, sweet pies and bowls overflowing with grapes. Light up the table with ornate candelabras. For frozen concoctions, take inspiration from the drinks of the era: wine and ale. Mix red wine with nutmeg and cinnamon for frozen concoctions with spice, or make some with ale, lemon juice and honey - be sure to stay true to the times and serve the frozen concoctions in goblets instead of regular glasses! And of course, keep spirits lively by encouraging guests to come dressed in their best medieval garb. This New Year's Eve, look to the stars for a sparkling soirée. When guests walk through your door, they'll be transported to a party space that's out of this world, filled with twinkling white lights, glimmering garlands of tinsel in silver and gold and glitter-painted stars suspended from the ceiling. Print out horoscopes for guests to see what the future holds, while telescopes set up on the patio offer a magical view. A starry-eyed party deserves equally enchanting frozen concoctions. Make a starfruit margarita with tequila, lime juice, starfruit liqueur and a splash of orange juice, and garnish with a slice of the fruit. The 1920s was an era of extravagance when people sure knew how to party. While you may not have famous authors and starlets swinging from the chandelier at your shindig, you can still create a Roaring '20s-inspired affair to remember. Flapper dresses, sequins and dapper suits are the encouraged attire, while records of swinging jazz tunes will get the Charleston going. Deck the space in glimmering silver and gold for appropriately showy decor. A benefit of throwing a 1920s party today is no Prohibition, so make sure you serve up show-stopping frozen concoctions made for celebration. '20s movers and shakers reached for the gin, so take a cue and mix up a frozen concoction with gin, lemon juice and honey, a recipe inspired by the preferred drink of the day. 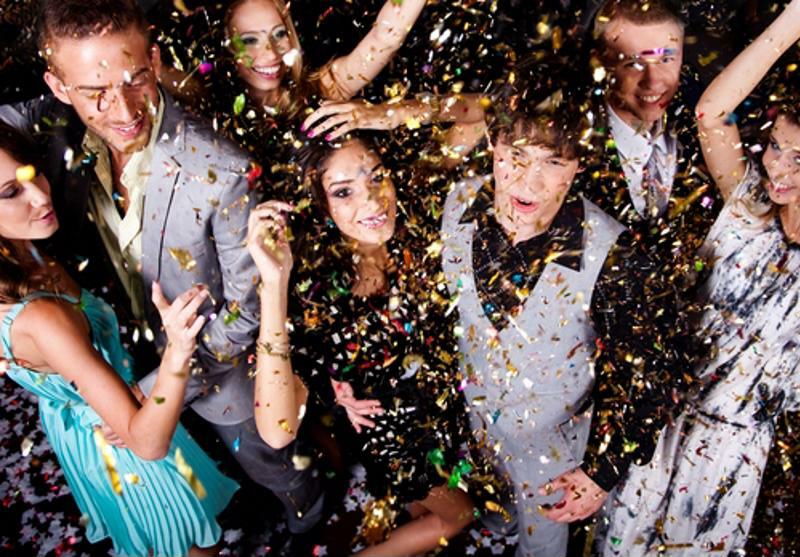 Ring in the new year with a bigger and better party than ever before! New Year's Eve parties suggest mischief, magic and wonder; a time when anything could happen and the future is all that matters. Conjure your own enchanted moments by hosting a Secret Garden party. Even if it's too cold to step outside, you can still create a magical space in your home - just bring the outdoors in. Garlands of ivy covering the walls, large potted plants and trees creating intimate corners for conversation, bunches of flowers in moody hues and string lights hung throughout the space hues create a breathtaking garden indoors. Be inspired by the natural world with frozen concoctions made with botanicals and herbs, like vodka mixed with delicate rose liqueur and gin combined with strawberries and fresh rosemary. Escape to a destination where the skies are always sunny, the waters are always turquoise and the piña coladas never run out. Transform your party space into a tiki paradise by going all out with island-inspired decor. The main attraction is the tiki bar, where your Margaritaville® Tahiti™ Frozen Concoction Maker® steals the spotlight. Set up tiki torches around the room and hang multi-colored string lights from the ceiling and across the bar. Buckets of sand with umbrellas stuck in them, beach balls tossed around the room and a constant playlist of island tunes create just the right tropical ambiance. Give out leis to guests, and play fun games like coconut bowling and limbo. For frozen concoctions, it's tropical all the way - have the piña coladas, daiquiris and margaritas flowing! For the eats, go with tasty island bites like mango-glazed shrimp, jerk chicken and grilled pineapple. Up the intrigue on New Year's Eve with a masquerade ball. Every guest should come wearing a gown or suit and a mask to conceal his or her identity - until the clock strikes midnight, of course. Keep the party chic and regal with white candles, sparkling decorations and centerpieces filled with feathers and pearls. Set up a makeshift photo booth with props so guests can have a playful memento of the evening. The frozen concoctions should be in dark hues with an air of mystery - mix vodka, blueberries and plum liqueur; rum, espresso and chocolate syrup or mezcal, blackberries and lime juice. Pop the bubbly this New Year's Eve in a bigger and more sparkling way than ever before! The decor is simple: silver or gold glitter everywhere, from the tablecloths to the balloons to the bar. Encourage guests to dress up in their most glittering outfits, and hang glitter streamers from the doorway that guests can walk through to make their entrance to the party. Make sure lots of confetti is on hand for when it turns midnight. Champagne, of course, should be the focus of your frozen concoctions - go for light, shimmering drinks like champagne mixed with orange and grapefruit juice, pomegranate juice and gin or cherry liqueur and vodka.